As much a boating experience as it is a show, the Greenwich Boat Show has built a reputation as the most boater-friendly boat show in the Northeast. It features a large, diverse selection of new boats, and it’s the only show that offers both free sea trials and free admission. This year, the show celebrates its 11th year on April 6 and 7, from 10 a.m. to 4 p.m. each day, along the Mianus River. With 23 dealers bringing more than 100 boats from over 50 manufacturers, boaters will have plenty of vessels to try on the open water of Long Island Sound. There is no other boat show like it, you can test ride new power boats to feel how they handle! This April, boaters will rendezvous to Cos Cob, Connecticut for what has become one of New England’s premier boating events of the year. The dealers involved are a who’s who of the best boat dealers in Connecticut. They include Oyster Harbors Marine, Petzolds Marine Center, Portland Boat Works, Essex Marine Group, Twin Hull Boats, All Seasons Marine Works, Essex Boat Works, Bassett Yacht and Boat Sales, and Marine Max. Also at the show will be Catalano and Sons, A & S Boats, Gerard’s Marina, Total Marine, Ribcraft, Mountain Motors and Beacon Point Marine. Additional dealers at the show include Castaways Yacht Sales, East Coast Yacht Sales, Harborside, McMichael Yacht Brokers, Prestige Yacht Sales, Rex Marine and S&S Marine. This year’s show feature several new brands, plus many favorites from previous years. Boaters who want to treat themselves with a high-end, luxury vessel can explore such brands as MJM, Viking, Tiara Yachts, Azimut, XO Boats, Meridian, Galeon Yachts and Mag Bay. On hand will be three luxurious brands from Beneteau - Monte Carlo Yachts, Gran Turismo and Swift Trawler. Boaters looking for luxury can also view boats from Chris Craft, San Juan, Back Cove, Axopar Boats, Sabre, Hunt Yachts, Southport Boats, Fairline and Bertram. For those who enjoy spending their days hunting fish, the show will feature some of the best sportfishing boats in the industry, with boats from Pursuit, Regulator, Edgewater, Blackfin, Boston Whaler, Albemarle, Fountain, Sea Pro and Everglades. Anglers can also check out vessels from Robolo, Sea Fox, Tidewater, Century, Sea Hunt, Scout, Seaway, Sailfish, Ribcraft and World Cat. Boaters looking for a vessel to take cruising or for enjoying a day of family fun on the water can consider boats from Regal, Grady White, Rossiter, Brig, Chaparral, Monterey, American Tug and Sea Ray. Also, there will be boats from Eastern Boats, Ranger Tug, Four Winns and Tige. Attendees in the market for a pontoon boat can check out vessels from Bennington and Southbay. If speed is what you’re looking for, the show will have that, too - both on land and on the water. For on the water, visitors can check out powerful, high-performance vessels from Donzi. For speed on land, Manhattan Motors will have iconic Lamborghiniis at the show. To secure a time to test drive your favorite boat, schedule a sea-trial time in advance on the show’s website, http://www.greenwichboatshow.com. 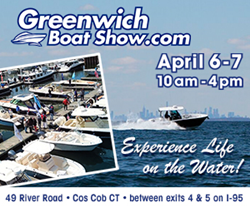 For more information on the Greenwich Boat Show, visit http://www.greenwichboatshow.com, or contact Karen Piscitelli at (203) 661-4033 ext. 251 or at Karen@greenwichboatshow.com.